Accept credit cards on your smart phone or mobile device using your existing merchant account and the CenPOS payment network. The CenPOS mobile app is free. There are no additional fees above standard CenPOS usage rates. CenPOS is sold as SaaS and merchant rates vary by business volume and type of use. ID-Tech makes a wide variety of reliable mobile swipe products that are compatible with CenPOS mobile apps. Visit their web site for other options. 1. The iMag is an encryption capable MagStripe reader, also made by ID Tech. There are multiple versions, including one for iPhone 4. Encrypted MagStripe Reader for iPhone 3G/3GS, iPhone 4, and iPod Touch. (Reads tracks 1, 2, and 3, bi-directional reading capabilities. For the power Apple user on a budget, the slim sleeve becomes a part of the phone and attaches at the bottom so you can still use your headset if desired. $61 at barcodesinc.com. 2. The Linea-pro 4 turns iPhone and iTouch into a powerful point of sale solution. It includes a 1D or 2D barcode scanner, a 3-track magnetic stripe reader, and a rechargeable battery extender in a compact protective case. As you can see from the picture, it’s nicely wrapped around your iPhone or Itouch. Purchase at Infinite peripherals or contact your CenPOS relationship manager. Choose this if you’re a heavy user and want a slim design, or integrated bard code reading, or integrated drivers license reading. MSRP $599 and up. 3. http://www.idtechproducts.com/products/mobile-readers.html. The Shuttle, Two-Track Secure Mobile MagStripe Reader– is compatible with almost everything. DRAWBACKS: Because it plugs into the audio port, the app will open and close repeatedly, making this the least desireable for smooth, fast transactions. 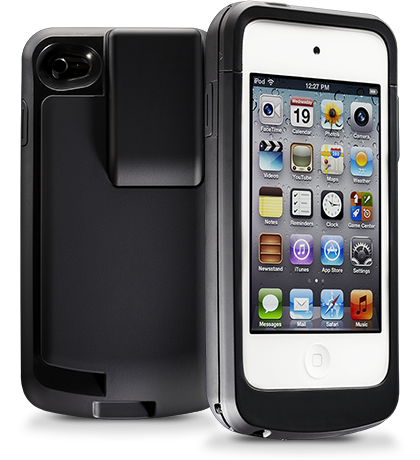 Works with new and old Apple products like iPhone 3, 3G, 4, 4S and iPad 2, iPad 3, and tablets. The rubberized grip that touches the top of your smart device keeps it from slipping. Most other products on the market do not address this simple fix to an old problem- if the reader moves while swiping, contact may not be good and the user has to swipe a second or third time. Choose this if you are looking for low cost, versatile mobile reader. $48.50 at barcodesinc.com. Notes: CenPOS mobile app is free. Merchants need to contact CenPOS sales to open an account, which includes free virtual terminal, free mobile app, 7 years of data stored, remote user management, and many other benefits. CenPOS is a scalable hosted payment processing network supporting multiple payment methods. The CenPOS gateway connects to your existing merchant account. Merchants can purchase hardware from any source. Global Channel Sales & Business Development, Christine Speedy, 954-942-0483. This entry was posted in CenPOS, Equipment-POS and tagged cenpos mobile, iphone app, linea pro, mobile payments, pos equipment by Christine Speedy. Bookmark the permalink.